The term Baby Led Weaning (BLW) refers to a way of weaning your baby without the use of purees. Advocates of BLW claim that this method of weaning results in children who are less fussy and less likely to overeat when they are older, although, there has not been extensive scientific research into these claims. The idea of BLW is simple. You give your baby a range of finger foods and let him explore the foods and feed himself. 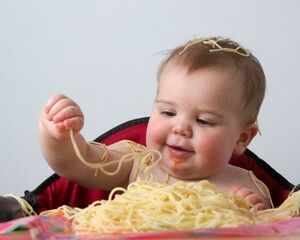 At first, your baby may only lick the food as he learns about it, but later he will chew and swallow. This method of weaning should only be used for babies who are six months and older. Whilst parents have been giving babies finger foods for generations, the idea of using Baby Led Weaning with no purees is a relatively recent one, and as a result, there has been very little scientific research into the health benefits of weaning using this method. However, advocates of BLW and parents who have used this method believe that children are more adventurous with their food as they get older, because they are used to exploring different tastes and textures from an early age. There is also some evidence that suggests children who are weaned by BLW are less likely to be affected by obesity during childhood. With BLW, your baby can eat the same food as you at mealtimes (providing you have not added any salt or other unsuitable foods – see Baby Food When Weaning for more information). This means that you don’t have to prepare more than one meal at a time, which is more convenient and cheaper than buying purees. Furthermore, as babies often learn by imitation, they will be encouraged to try different foods by watching you eat the same. What Are The Downsides of Baby Led Weaning? There has been a small amount of research that has suggested that babies, particularly those with developmental delays, who are weaned using solely BLW may not get all the nutrients they need, and that in these cases a combination of purees and BLW may be better. Furthermore, at six months old babies need additional iron from food to supplement that which they get from breastmilk and some iron rich foods such as red meat may not be suitable for BLW as they are difficult to chew. BLW is very messy, especially when compared to spoon feeding using purees. 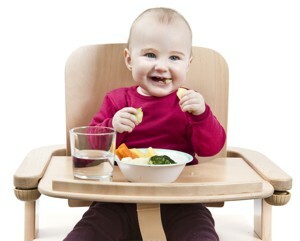 The best way to feed your baby using BLW is to simply use the tray of the high chair instead of plates and bowls. That way you can take it away after to clean. If your dining area is carpeted, consider getting a plastic sheet or special mat such as this one from Prince Lionheart that can be placed under the highchair and then easily removed and cleaned afterwards. Most foods are suitable for baby led weaning, providing they soft enough for your baby to chew. Foods that are cut into “chip” shapes are best, as these are easiest for your baby to hold until he is old enough to master the “pincer grip” at around eight months old. Possible foods you might like to start with include cooked fruit and vegetable pieces such as apple, carrot, and pear, some soft fruits such as ripened peaches and bananas, bread or toast “soldiers”, cheese, and cooked pasta. You can also give your baby foods such as rice or yogurt and a spoon to use themselves, though it might take them a while to master it. Is There A Risk Of My Baby Choking? The fear of a baby choking is one that often puts parents off the idea of Baby Led Weaning, but those fears are generally unfounded. Babies have a very strong gag reflex and will respond accordingly. Your baby should be sat up to feed, and should never be left unattended. Give only soft foods to begin with until your baby is more comfortable chewing. If you have been using purees previously and now switched to BLW, your baby may be at risk of choking at first as he is not used to firmer textures.